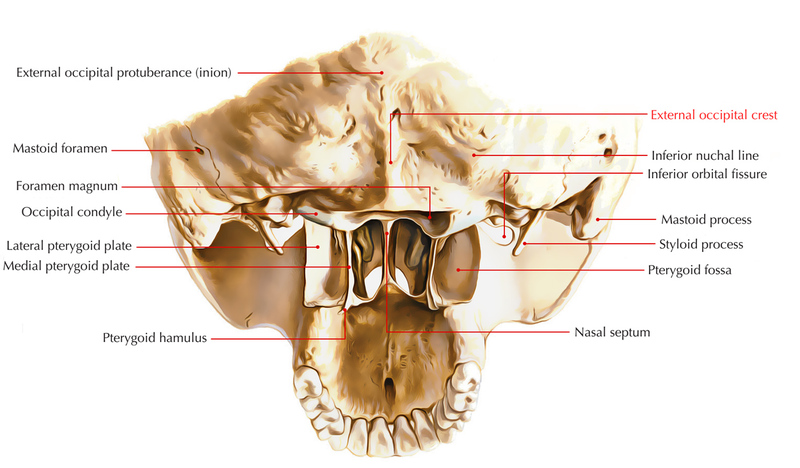 The External occipital crest is part of the external surface of the Squama occipitalis of the occipital bone. External occipital crest travels lengthwise the midline, starting at the external occipital protuberance and going inferiorly towards the foramen magnum which attaches to the nuchal ligament. From the middle of the external occipital crest two inferior nuchal lines, one on each side turn laterally. Left and right masses of nuchal muscles, complexus superior and rectus capitis inferior are divided by the external occipital crest. From the posterior border of the foramen magnum towards the superior nuchal lines that indicate the limit of the attachment of the nuchal muscles, it travels sagittal on the nuchal surface of the occipital bone. The occipital crest can be divided in superior and inferior portions, above and below the inferior nuchal lines. A reflexion of lateral reliefs with no protuberance.